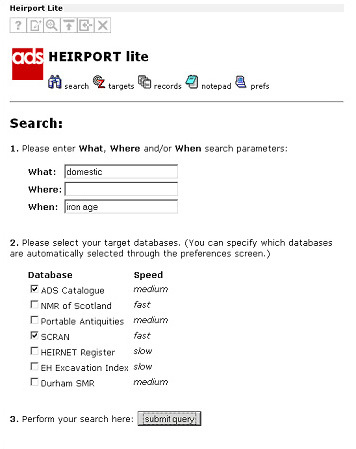 This section illustrates the standard functionality of the HEIRPORT lite portlet. 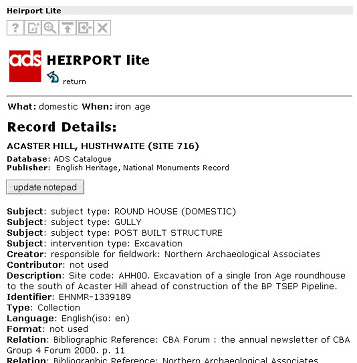 The various screenshots of the HEIRPORT lite portlet have been taken from an Archaeology Data Service (ADS) installation of the JA-SIG uPortal portal software (Glossary). The initial welcome page provides a general introduction to the portlet, stating the purpose of the CREE project, together with a selection of links to various partner websites that have been included in an effort to place the portlet application within the relevant context. There are several icons positioned across the top of the portlet to help navigate the various different views of the query process. This 'menu bar' system has been achieved by including a JavaServer Page (JSP) fragment that changes depending on the current view. By clicking on the 'search' icon, the user is presented with a form divided into three specific areas used to build a query. The first area is used to enter various query terms. Although HEIRPORT supports both the full BATH (Title, Subject, Description etc.) and CIMI (Who, What, When, Where etc.) profiles, it was decided that only a subset of these would be used. 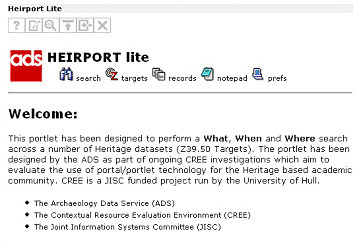 The What, Where and When elements from the CIMI profile were thus deemed sufficient for this portlet implementation  hence the addition of the word 'lite' to the portlet title. As HEIRPORT is based around simultaneous Z39.50 searches across a number of different datasets, the user should be given a choice of targets which they are interested in querying. The second section of the form allows the user to do this by ticking the relevant check box(es) found next to the list of available target databases. An indication of the speed of each target has been included to provide the user with a hint as to how long the initial query may take. The third and final section of the form contains the submit button to initialise the search. Depending on the speed of the selected target servers, the user is eventually forwarded to a target summary screen. A query trail depicting the various search terms is displayed below the set of icons at the top of the screen. Below this, a summary for each of the selected targets is displayed: if the target database is down or returns a specific error, an appropriate error message will be displayed here. At this point, the user can decide to fetch the records from a particular target by clicking on the appropriate 'fetch' button. For the user's information the number of records that match the query and the execution time for each of the targets is also displayed here. The information displayed on this screen is persistent throughout the session until a new search is performed. At any stage of the query process, the user can click the target icon and return to this screen allowing them to fetch results from a different target server. 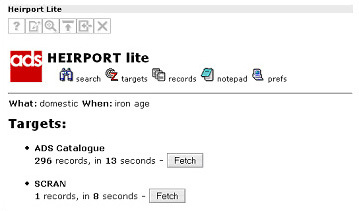 After HEIRPORT lite has fetched a set of records from a particular target, the user is forwarded to a results screen as shown in Figure 6. The query trail is maintained across the top of the results listing so the user can always check which parameters the record set pertains to. A simple paging mechanism has been provided by way of 'previous' and 'next' links. The number of records per page has been set to a default value of 10. This value has been set as a portlet preference entry and can be changed via the preferences page if the user so desires. 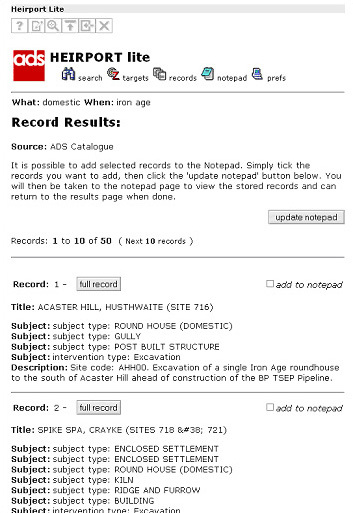 Directly below the navigation links, the record set is displayed as a series of brief summaries of each record. These summaries include the record title, subject fields and also the first 30 words contained within the description field. At this point, the user can request more detailed information by clicking on the 'full record' button found at the top of each record summary. If the user elects to request a full record, they are forwarded to the record details screen as shown below (Figure 7). The information displayed on the details screen is based on the details that the target database contains for that particular record. Consequently certain records may be sparse while others may contain rich information across a number of different fields. The available fields are based around the BATH and CIMI profiles and are presented using the Dublin Core metadata standard.